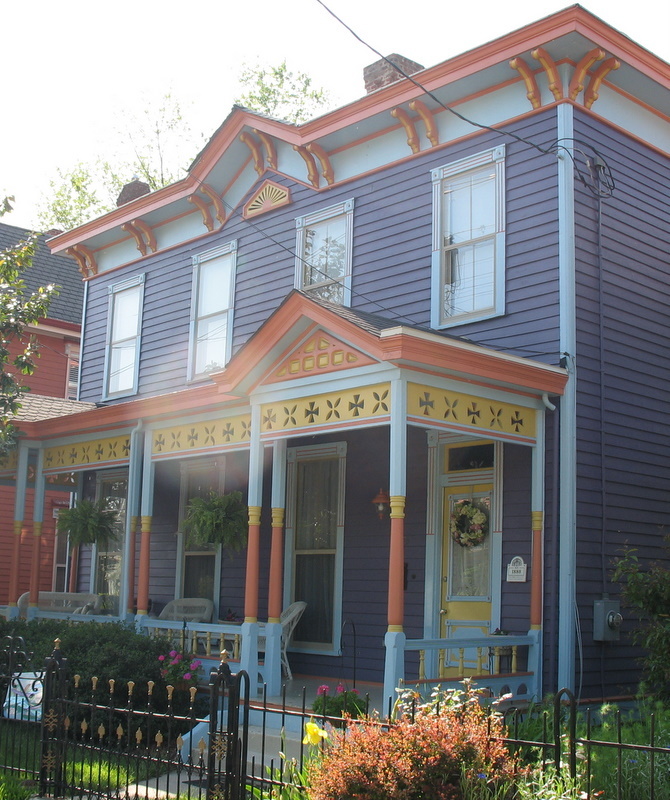 Irecently discovered Amber’s blog Snapshots of Life, which featured some amazing photos of Columbia Tusculum and its famous “Victorian Painted Ladies.” I was excited because these houses are beautiful, of course, but also because they’re not far from where I live here in Cincinnati. Somehow it had never occurred to me to show them to you. I asked Amber if I could show you some of her pictures, and she graciously agreed. Remember that home show tour I showed you pictures from last week? Afterwards, we drove over to Columbia Tusculum and took some photos of it, too. 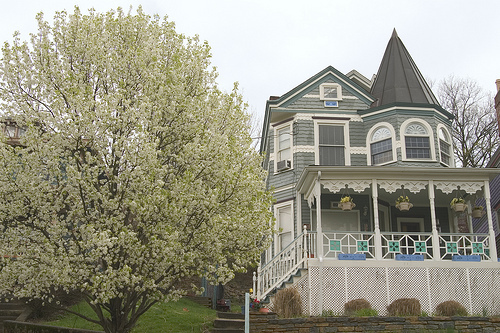 Dave patiently drove up and down the steep hills of the historic neighborhood at about 10 m.p.h. 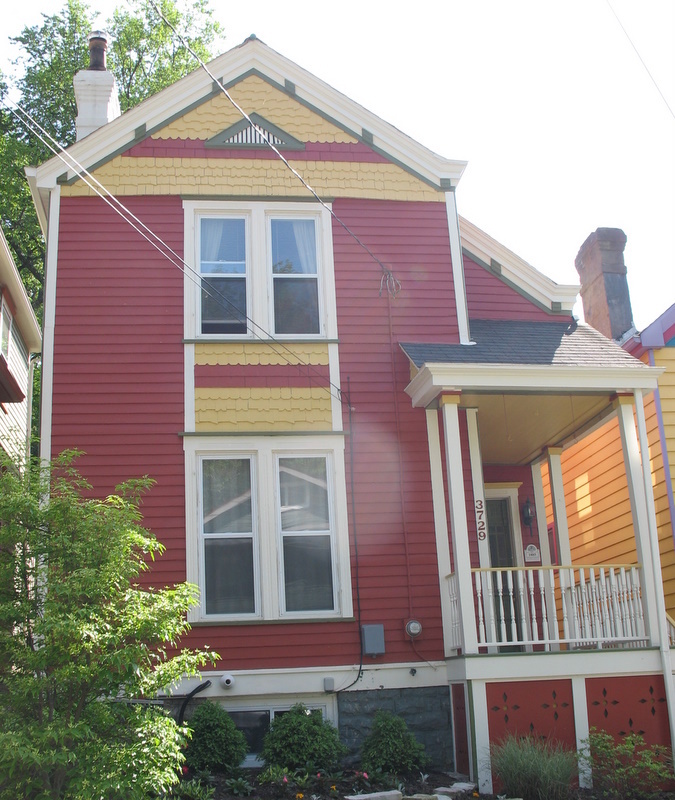 so I could snap as many photographs as possible (let’s just say we got honked at a couple of times for blocking the narrow streets as I tried to decide which houses to focus on), so I’ve got some of mine to show you, too. 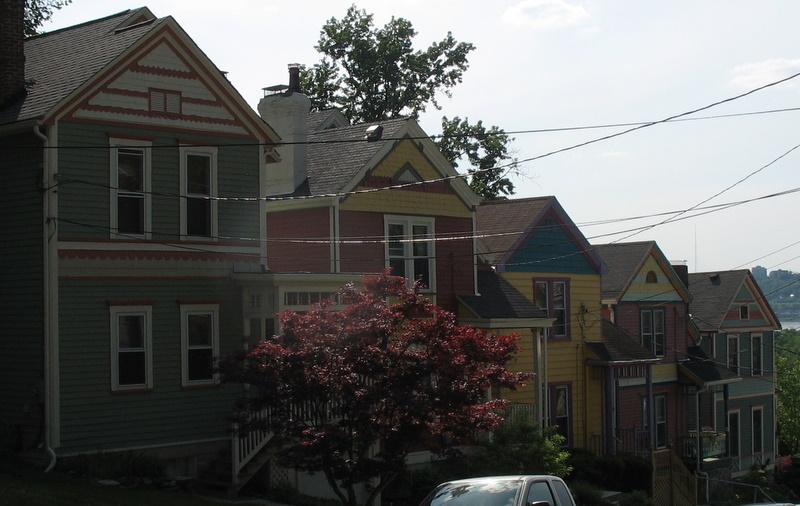 Columbia Tusculum is the oldest neighborhood in Cincinnati, founded in 1788 at the junction of the Little Miami and Ohio Rivers. 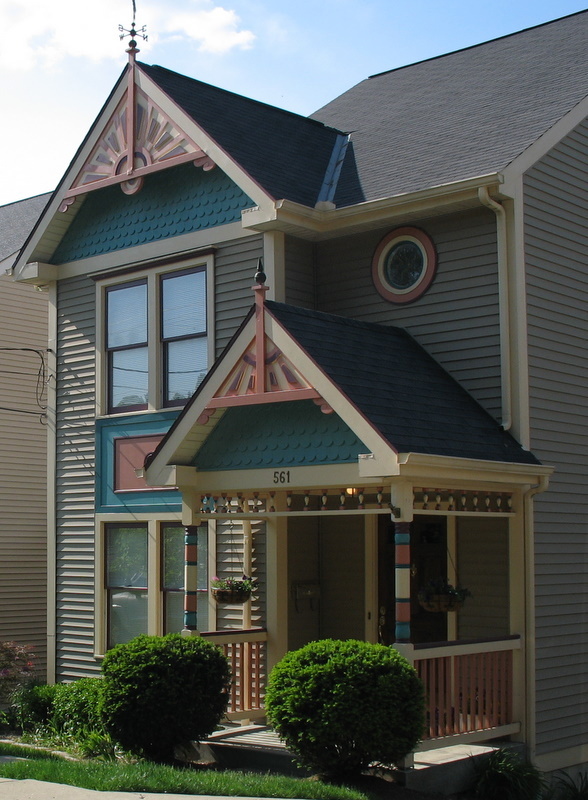 This was shortly before Cincinnati–originally named Losantiville–was settled. 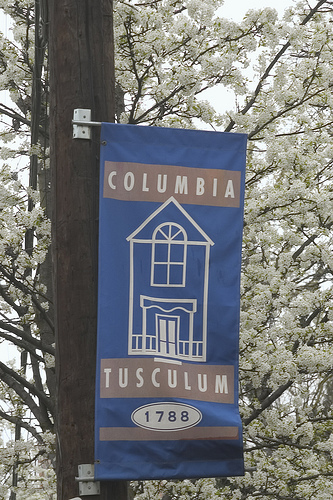 Columbia Tusculum opened the first school in the Cincinnati area in 1790. For years it was known as a steamboat-building town and was very prosperous. The oldest home still standing was built in 1804. Thanks again to Amber for inspiring this post and for generously sharing her photos of the area with us (go to her blog Snapshots of Life to see the rest that she took). Gosh, wouldn’t it be fun to go to Lowe’s to pick out *those* colors!! 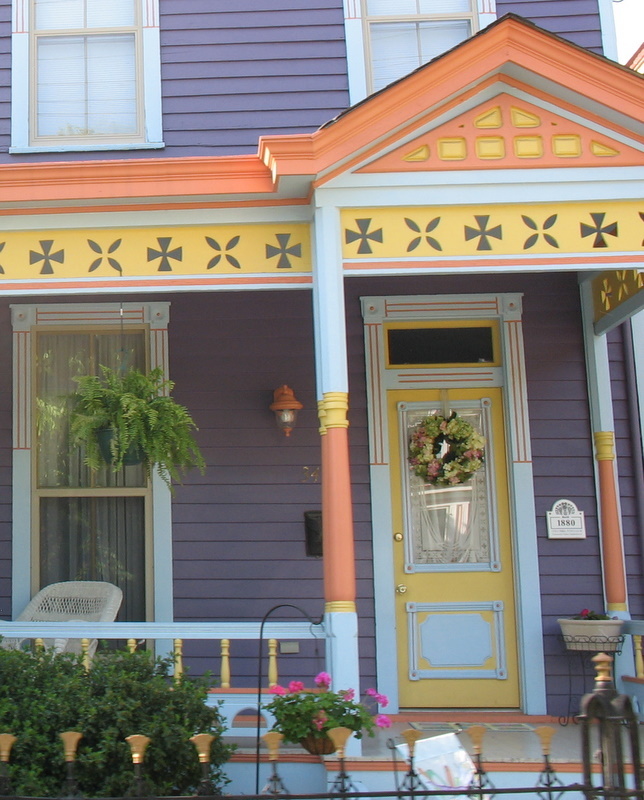 The paint really brings out the tiniest details in these houses. It’s amazing. Can’t wait to see the inside of that yellow one! Hard to pick a favorite, but I’m torn between the one whose address is 561 (mostly green) and the one with the address of 3729 (mostly red). Also love that green one in the fourth shot. Least favorite are the REALLY bright ones (the purple, pink and yellow and the blue, purple and yellow ones). 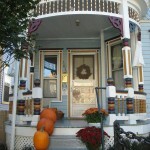 Great pix and what a fun neighborhood. Bet those residents have strong legs and glutes( is that how you spell that; looks ridiculous?? ), lol. Makes my Providence shots look very somber. I can’t pick one either. I love them all! 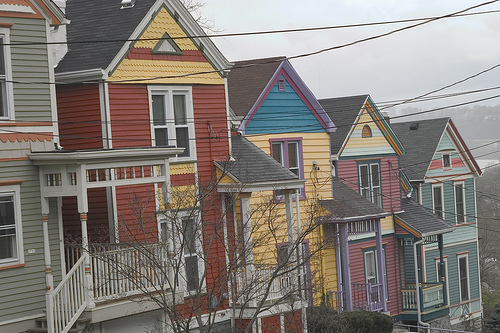 It’s like looking at a Crayola box filled with houses rather than crayons. 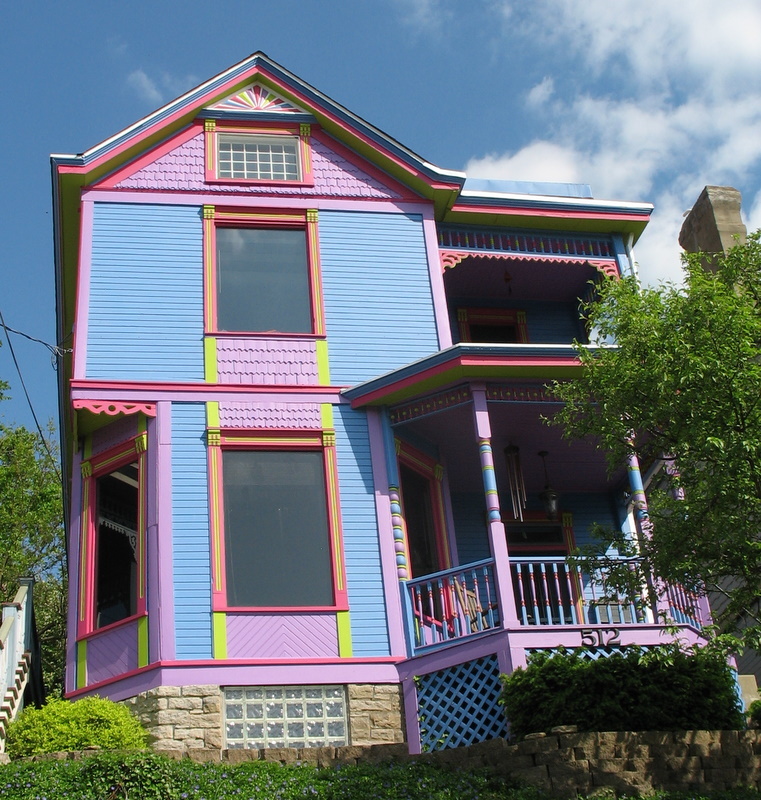 I love the creativity and the obvious lack of “neighborhood association” rules about pastels only! I found myself going ooh.. and awe… after every picture. Can’t wait to see the inside on the yellow one! No fair – I want to see inside! Can’t wait to see your next post. 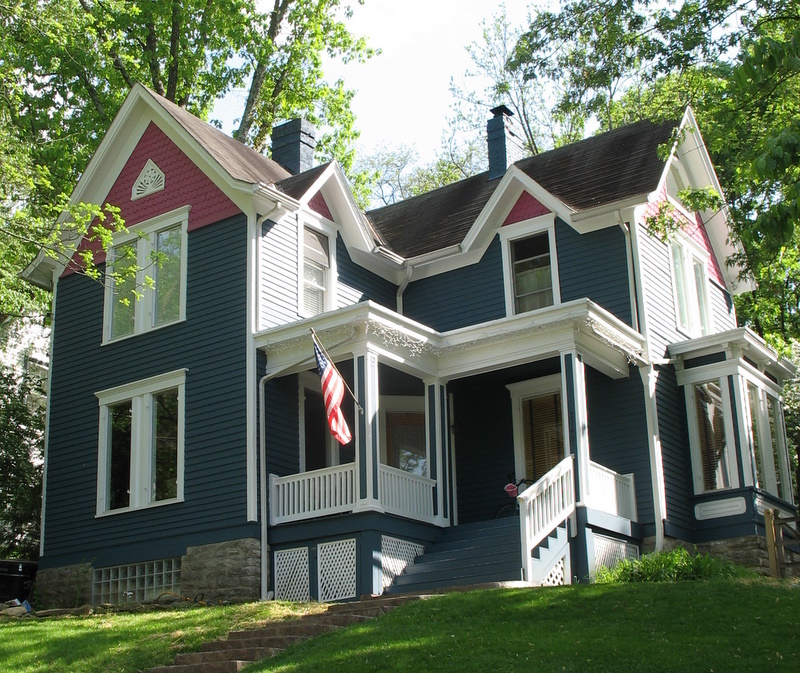 They are so fun to look at but I don’t think I could live in a house that had more than 5 colors of paint on the exterior 🙂 But I do love Victorian homes when they are updated with some modern style. Oh how I love our city. I can’t wait to go down there and have a look for myself! Thanks for reminding me of all the great sights to see around here! 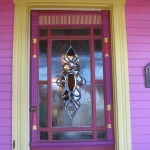 BTW, I love them all except for the really bright PINK one, which if I won in a lottery, I would paint a cheery yellow! They’re all my favorite! Love them! Can’t wait to see inside the yellow one! 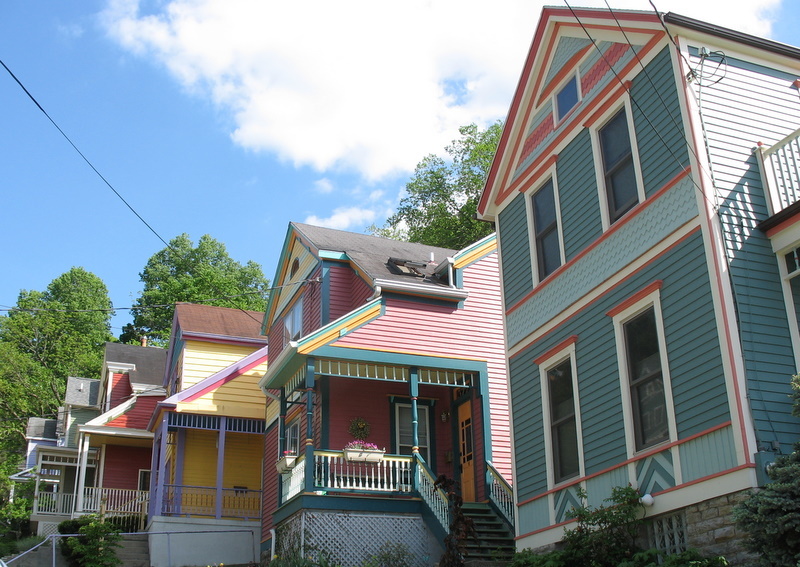 I loved all these colorful houses. I wanted one that I could paint all funky for myself. How cool, to totally have an open palette and do whatever struck your fancy (that you’d be willing to live with for awhile, unless you could afford a painter every time your whims changed)? It’s frightening how many of those 50’s BH&G rooms I”ve seen in real life. In my family. Yes, I run screaming. The crown moulding room? Too much for me, but I was more obsessed with how CLEAN the room was. I really like that clean look they have going, but I bet it wouldn’t last long at my house, if I did manage to acheive it. I like things too cosy, but then it’s so hard to keep them clean (and my kids out of the mess). One day I’ll purge all my husband’s stuff, and the hand-me-downs he INSISTS on keeping, and my house can be more like the crown moulding room. How could Paul Bettany and his wife trade something so beautiful for something so ugly? Forget the view. (Well it was good.) Their son’s better off being found at the park than in the river. They’re crazy. I liked Paul Bettany best in “A Knight’s Tale” with Heath Ledger. Nothing like a naked man who’s funny. So did he and his wife start dating while filming “A Beautiful Mind,” do you think? 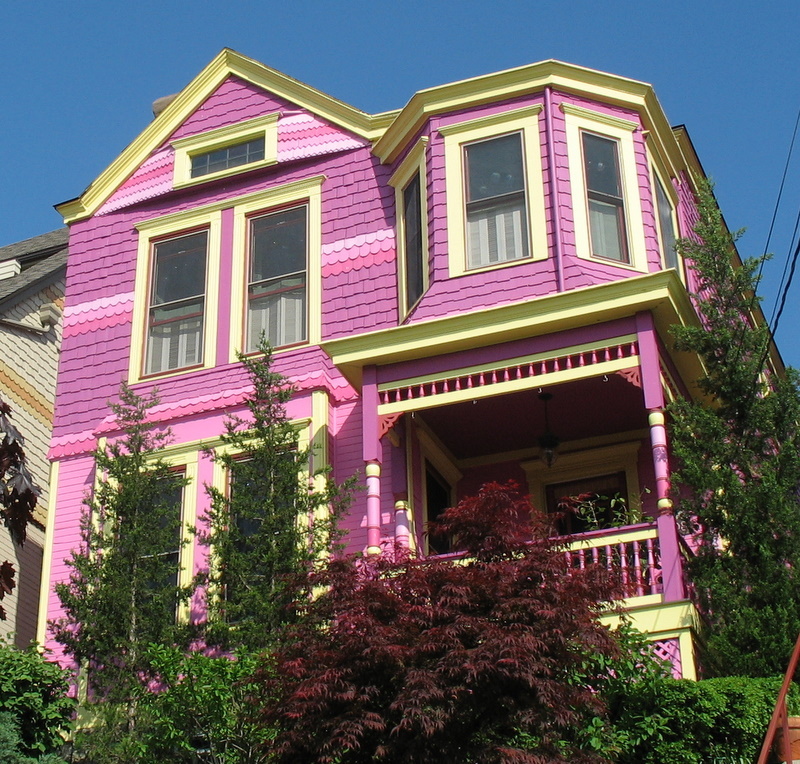 I love Victorian houses if for no other reason than the freedom to use what would be completely outlandish colors on any other style house! 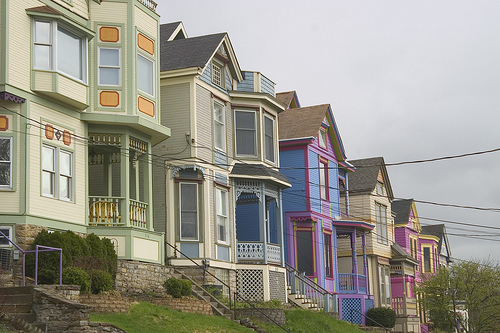 THey are all so pretty – it’s hard to believe people actually painted their houses those colors, but it works for them, doesn’t it? 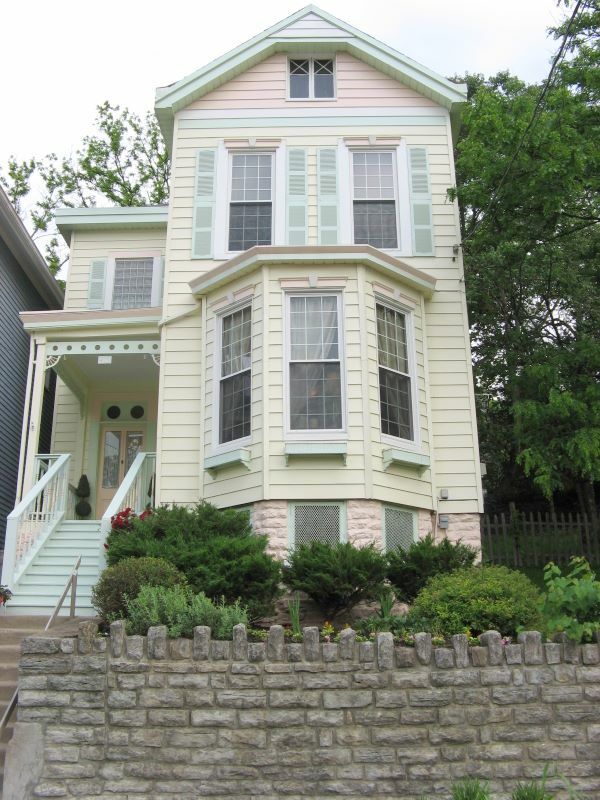 I think my favorite is the house that is different shades of lavender, with the lavender flowering bush out front. 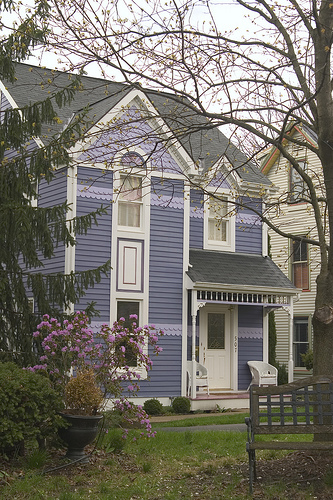 I can’t see ever living in a purple-y house, but I think it’s so pretty. We drive Tusculum hill every day because Lily goes to school at the Villa.Every day ,without fail ,she tells me the purple one will be hers when she gets big enough. I guess when you’re 5 years old the gaudier the better, right? I do love looking at them. That’s alot of paint ! My fave: the blue and orange combos. It is fun to see these, such different architecture than what we have around here! Fun colors! We have some of those, but not many! I have your link saved now for the DRIVE BYS: AROUND THE WORLD post, I’ll put it out in a couple of weeks once I get enough links to share. It should be fun to see everyone’s neighborhoods! What a beautiful neighborhood. 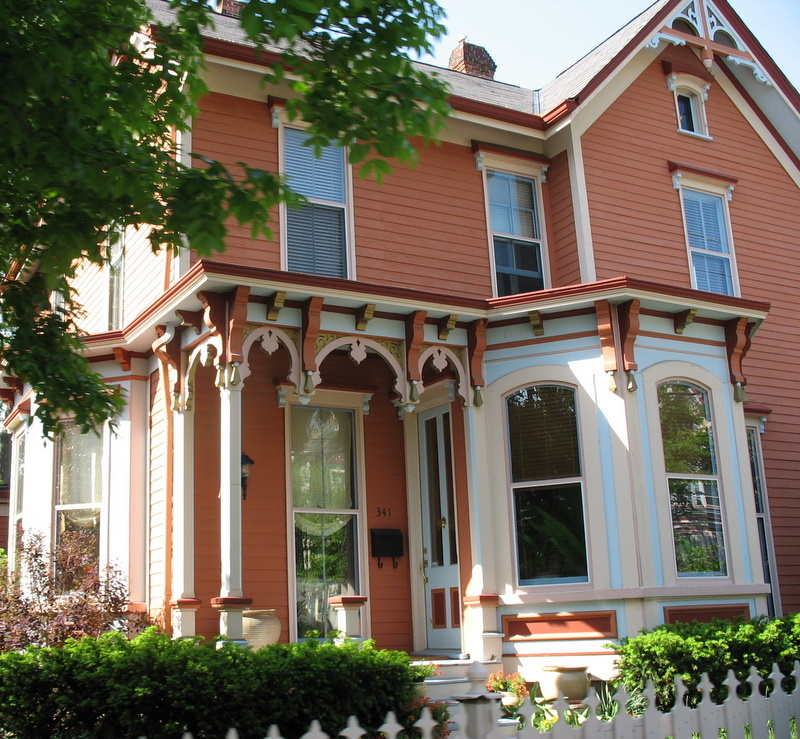 I personally am not a fan of Victorian style anything at all…but these houses are pretty. I cannot imagine how you explain to the painter where you want which color. 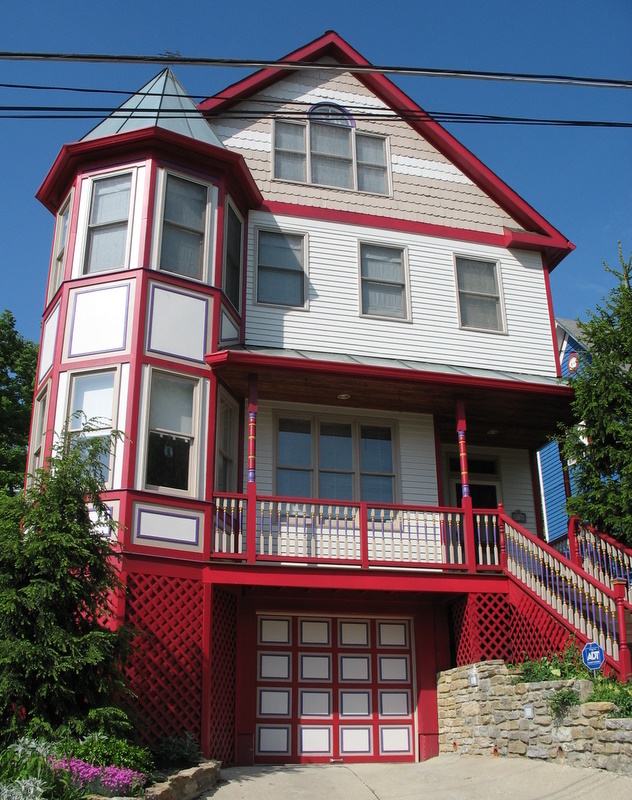 After about the 6th color on one house I would give up….LOL. Now I’m going to go have a look inside the yellow one! 3rd picture down..the blue one. I love it. I have been through this neighborhood but it has been awhile. I am thinking I need a trip down to Cincy and take it in again! Such color! I’ll have to be sure to come back for the tour! 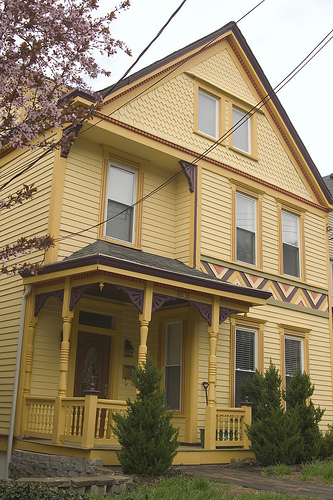 I love painted ladies! We have one in my hometown and it was most interesting watching the painting go on. Is it even possible to choose a favorite? If so, I’m going with the pale yellow and pastels in the last one. Lovely! 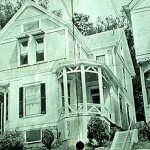 I grew up in the house pictured on the far left in the first photo–516 Tusculum. 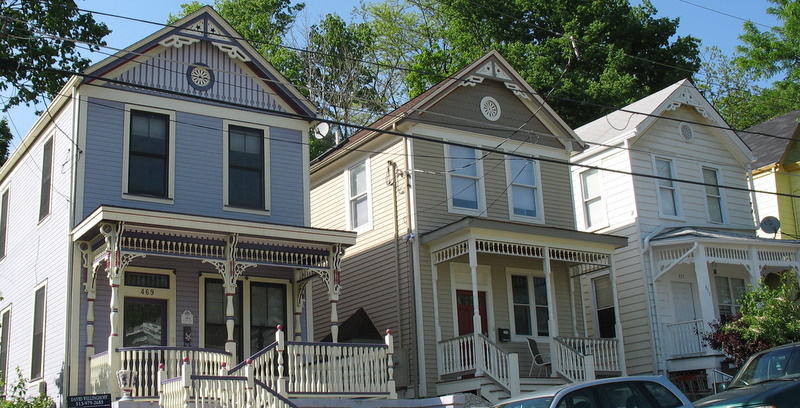 A couple of the homes pictured are actually reconstruction. 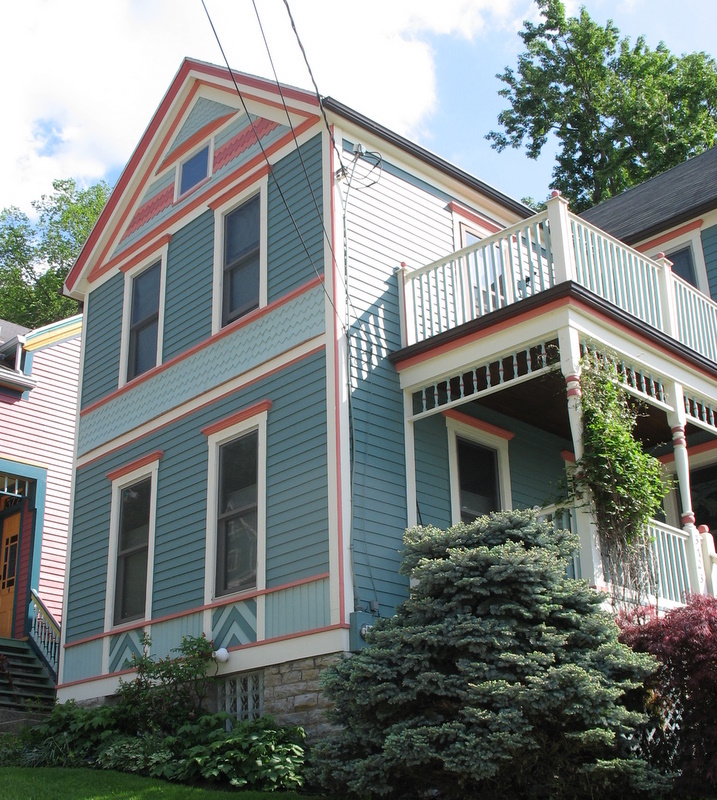 They were built to replace homes that met the wrecking ball in the 70’s before the neighborhood saw it’s Renaissance. 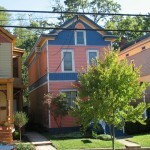 My girlfriend lived in the purple house. 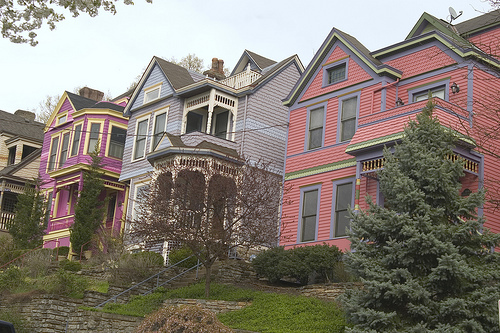 Whenever my husband and I go back to Cincinnati, we always have to drive up the street and see how wonderful it looks! I love all those! They’re really pretty.